Please join us in welcoming back Ben Goossen ‘13! Ben will take you through the experiences at Swarthmore that helped shape his decision to pursue a Ph.D. at Harvard University. 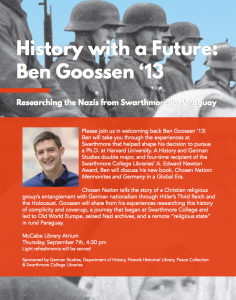 A History and German Studies double major, and four-time recipient of the Swarthmore College Libraries’ A. Edward Newton Award, Ben will discuss his new book, Chosen Nation: Mennonites and Germany in a Global Era. Chosen Nation tells the story of a Christian religious group’s entanglement with German nationalism through Hitler’s Third Reich and the Holocaust. Goossen will share from his experiences researching this history of complicity and cover-up, a journey that began at Swarthmore College and led to Old World Europe, seized Nazi archives, and a remote “religious state” in rural Paraguay.